When can a 20-guage have more felt recoil than a 12-gauge? I found out during the latest range session. 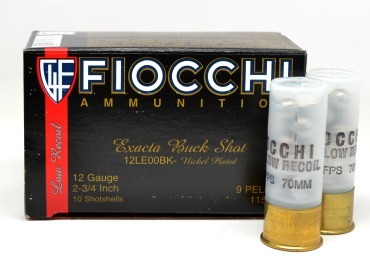 I had received in some Fiocchi Exacta Low Recoil 1-ounce slugs (1150 fps) and some Fiocchi Exacta Low Recoil 00 Buck (1150 fps) for the mighty 12-gauge. I wanted to compare these against the Remington Slugger 5/8-ounce slug (1580 fps) and Remington #3 Buck (1200 fps) for the 20-gauge. All shells are 2 ¾” chambering and high-brass. I thought that the comparison would be interesting. There are some, like myself, who are not fond of the recoil of full-load 12-gauge ammunition, and instead, lean to the 20-gauge for home-defense use. What I (and my shooting partner) found during this session has changed my mind about the 12-gauge. The test vehicles were a Mossberg 500 Tactical Model in 12-gauge and a Mossberg 20-gauge Tactical model. The 12-gauge had the standard 18.5-inch barrel; whereas, the 20-gauge has a 20-inch barrel. A standard silhouette target was set at about 9 yards, which would be about the indoor distance of the hallway in my home into the living room. Nine yards would also be a good distance to “pattern” the 12-gauge 00 Buck and 20-gauge #3 Buck. On the shooting table, the 12-gauge shotgun was on my left and the 20-gauge shotgun to my right. Both were set so that the chamber was exposed. I would lay a Fiocchi low-recoil slug in the 12-gauge and a 5/8-ounce “Slugger” shell in the 20-gauge. Then I would shoot the 12-gauge, set it down, and then shoot the 20-gauge. I would repeat this test for the 12-gauge Fiocchi low recoil 00 Buck and the 20-gauge Remington #3 Buck; gauging (no pun intended) the felt recoil of each. First, let’s make things easy. The difference in velocity of the 12-gauge Fiocchi low-recoil 00 Buck and the Remington 20-gauge #3 Buck is fifty feet-per-second (1100 fps for the Fiocchi and 1150 fps for the Remington). There was no appreciable difference in felt recoil between the two. When running the slugs; however, there was a different tune to be whistled. While no 12-gauge shell is actually pleasurable to shoot, having a 1-ounce slug recoil less than a 5/8-ounce 20-gauge slug is actually a pleasurable thought – and so it was in practice. The difference in felt recoil between the Fiocchi low-recoil 1-ounce slug and the Remington 5/8-ounce 20-gauge slug was impressionable. One would not think that a mere 430-fps would make that much of a difference. Even the muzzle blast noise of the Fiocchi ammunition was much less – and that makes a big difference if you have to light one off indoors and you didn’t have time to get hearing protection in place. The recoil impulse of the Fiocchi Exacta Low Recoil 1-ounce slugs was more of a heavy shove; whereas the recoil impulse of the Remington Slugger 5/8-ounce slug was sharp and to the point. The former lends to quicker follow up shots. As far as the patterning with the buckshot loads, both the low-recoil Fiocchi 00 Buck and Remington #3 Buck patterned well at the target distance. With the low-recoil Fiocchi 00 Buck, you still have nine .32 caliber pellets at your disposal; whereas, with the Remington 20-gauge #3 Buck there is twenty .24 caliber pellets blasting out of the end of the barrel. There was a small scattering of pellets near the outer edge of the 9-ring of the target with a few creeping just beyond the 9-ring. With that said, any center-mass shot with either load would make a Coroner cuss. Now, we can talk energy figures all day, but in practical terms, there is enough energy with any of these loads to get the job done for defensive purposes – 12-gauge or 20-gauge – no matter. I think that there will be some more of this low-recoil fodder coming into the house and I just may find myself dusting off the trusty-twelves. It is important to note that low-recoil ammunition works fine in pump-type shotguns, but may not work so well for effectively cycling the action of semi-automatic shotguns. 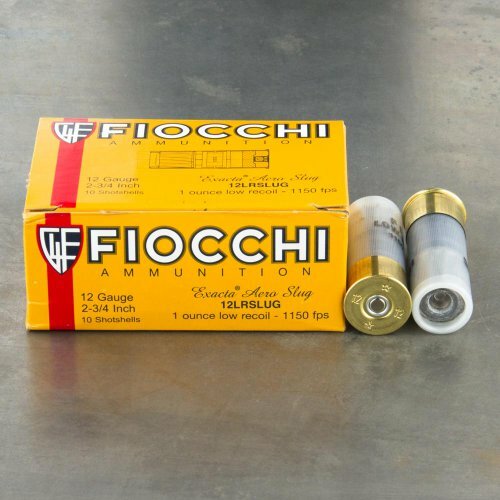 The final thoughts are; if you like the 12-gauge, and you like slug ammunition, but you don’t like the extreme rearward energy of the slug ammunition, the Fiocchi Low Recoil 12 Gauge 1 oz. 2 3/4″ rifled slug just might be for you. right now, I can say that it is for me. #00 Buck has always been a great defensive load. The Remington version of this load runs out about 1325 fps, which is still pretty stout for HD use. The Fiocchi, 12 Gauge, 2 3/4″ “00” Low Velocity Buckshot, running at about 1100 fps, is more than adequate for PD or HD use, in my humble opinion.